Go to the Slider menu. Click on the Add item button at the top to create a new slide. Note: If you can’t see the Slider in the sidebar go to Appearance > Install Plugins to install and activate Exquisite Theme Elements. 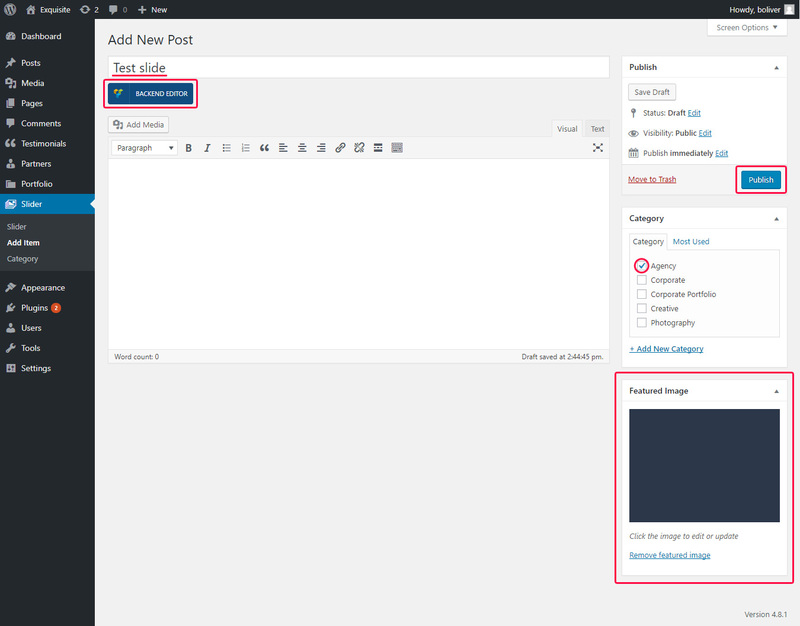 Set the title then you can create your content in the editor via the default WordPress editor or by switch to the Visual Composer Backend Editor. On the right you can set a category. Later on you can filter your slider to show only a certain category. Below the categories set your Featured Image. This will be the background of your slide. Finally click on Publish. The slides are sorted by date, so you can modify the order by changing the published dates. You can simply add sliders to your page by using the Content Slider Visual Composer element.